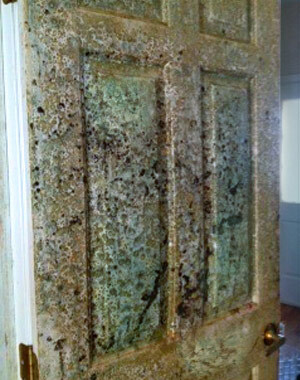 The genus of mold that is commonly referred to as the "black mold" is Stachybotrys chartarum. Stachybotrys chartarum is commonly found on cellulose based products- such as drywall, wood or paper - where there is moisture caused by things such as: water damage, humidity, condensation or flooding. Stachybotrys chartarum needs a constant moisture source for its growth. (Center for Disease Control) Stachybotrys chartarum has the ability to produce a variety of mycotoxins, which can affect people in a variety of ways. Molds colonize in a variety of colors including: black, brown, green and white. Just because a growth is black does not always mean it is a dangerous mold or an unhealthy mold. If you have had mold testing done to determine that you have unhealthy mold in your home, contact us for your free estimate for mold remediation.